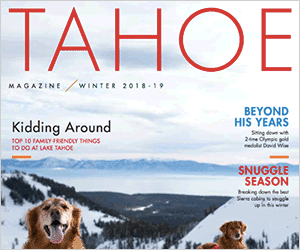 Recently, back-dropped by Lake Tahoe’s snow-capped peaks, shocked UNR researchers and a somber Tahoe Regional Planning Agency manager picked ski season to tell national audiences how monster goldfish were threatening Lake Tahoe’s ecosystem. The 20-year-old faux-issue is isolated to the Tahoe Keys, a 740-acre South Shore development that replaced the Upper Truckee River Marsh with 1,500 homes with boat access to Lake Tahoe from backyards that stretch along 11 miles of dredged channels. Not only do the Tahoe Keys’ lagoons and canals sport goldfish, but they are an unnatural refuge for 19 other nonnative aquatic plant and animal species that cannot effectively establish outside the well-nourished, warm-water preserve that replaced Lake Tahoe’s most important wetlands. Lake Tahoe’s environment is not fragile. It takes a very tough and adaptable species to survive in the lake’s cold, low-nutrient waters, and few are equipped to live there. When John Fremont discovered Lake Tahoe, there were only seven native fish living in its waters. One, the cutthroat trout, was driven to extinction by over-fishing and parasites carried by game fish introduced by wildlife agencies. Of the other six native fish, three are minnows (redside shiner, speckled dace, Paiute sculpin) and the other three are inedible (tui chub, Tahoe sucker, mountain whitefish). None are endangered. Last year researchers removed 12,000 fish, including crappie, bluegill, and bass, from the Tahoe Keys. TRPA officials said that despite the number of fish removed, capture rates didn’t go down, so it is doubtful the removal had any impact. When asked what was done with the fish, a TRPA manager said they were taken to the University of Nevada for research. Many fishermen find it strange that chub and suckers receive an elevated status above crappie and bass just because they were here first. But even stranger is why wildlife managers justify giving “naturalized” status to recently introduced trout and salmon, while relegating bluegill and bass to the tawdry under-class sent to UNR for research because they are “warm-water” fish. While gill-netting and electrocuting selected nonnative fish in the Tahoe Keys may seem unnecessarily cruel, what UC Davis and the Tahoe Environmental Research Center are doing to a dozen of Lake Tahoe’s native plant and animal species is downright depraved. Last fall, five acres of black rubber mats costing $810,000 were placed across the mouth to Emerald Bay to “control” Asian clams. Asian clams are one of the 20 species designated as “invasive” to Lake Tahoe. He was almost right — it’s not Asian clams that are negatively changing the ecosystem, but environmental engineers. The rubber mats used to suffocate the clams also slowly kills everything else under the mats. A UC Davis professor says, “You see death just about everywhere. One of the disadvantages of the mats is that it takes out the good guys along with the bad guys” — the bad guys are Asian clams. The good guys are a dozen of Tahoe’s native plants and animals. When asked why the mats were going to be left in place for a year, a TRPA manager said so as not to disrupt nesting egrets and other wildlife. He recently said so as not to interfere with the high-boating season. The Tahoe Resource Conservation District manager says it’s to make sure all the clams die. Steve Urie is a Truckee resident.